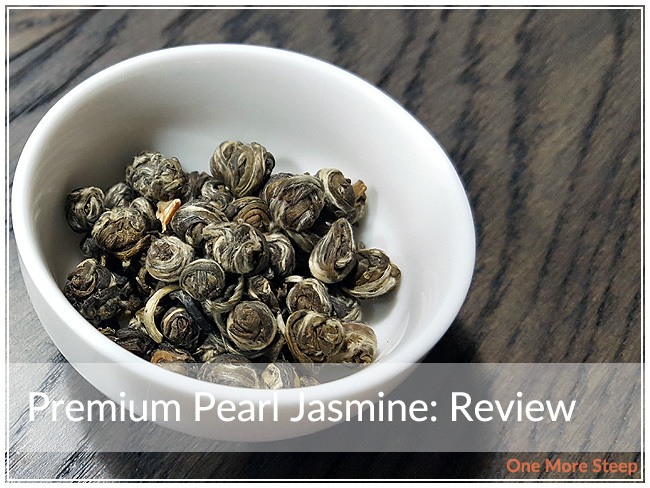 Grand Tea has provided me with Premium Pearl Jasmine for the purposes of providing an honest review. I received this product at no charge to me and received no other compensation. I love a good jasmine tea from time to time, so I was happy when Grand Tea sent me their Premium Pearl Jasmine to try. The sample packet is full of little tea pearls and they smell amazing! The jasmine fragrance is so strong, and the little pearls are just so tightly rolled. It’s really quite a pretty tea and with a tea like this, the nice thing is that you don’t need to use a lot to steep a whole teapot or cup because of how much they open up. Pearl or blooming teas are really fun to watch open up, so I’d recommend doing it in a clear glass teapot/cup for added tea entertainment. 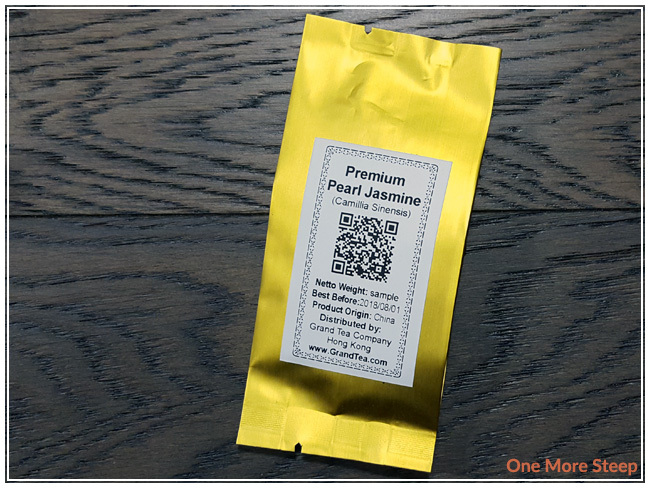 Premium Pearl Jasmine is a green tea scented with jasmine, that’s been rolled into pearls. Can’t deny it, it’s kind of nice when the name of a tea is a direct description of the tea itself. Grand Tea recommends steeping Premium Pearl Jasmine in 85-90°C (185-197°F) water for 3 minutes, and to spin the glass (if you’re steeping in a glass) or otherwise just irritate the water so the pearls move and open up. I steeped mine for 3 minutes and moved the infuser up and down to move the pearls as they opened up. My first steep of Premium Pearl Jasmine resulted in a fairly pale yellow cup of tea, the smell is purely floral because the jasmine scent is so strong. On first sip, there’s a sweetness to the tea that goes well with the floral flavour. After the first three minutes of steeping, the tea leaves haven’t fully unfurled and rolled open, so there’s still some flavour locked up! 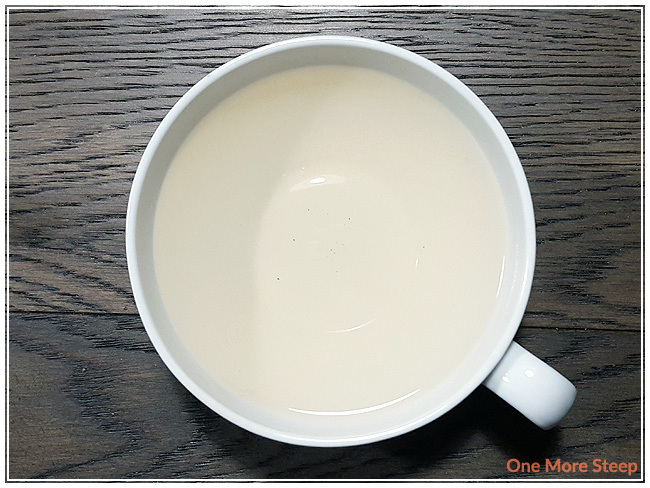 I found that three minutes was a good amount of time for this tea, the tea lacks bitterness and astringency, and has a smoothness that can be hard to find in green teas. It goes down easy and I eagerly steeped it again. 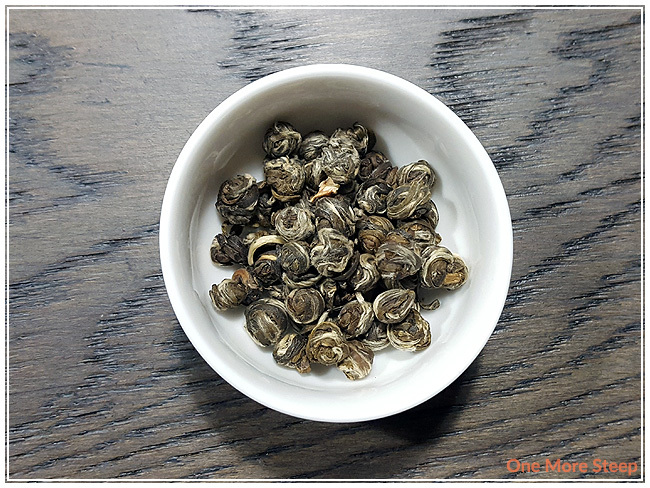 I resteeped Premium Pearl Jasmine seven times (eight steeps total), increasing the steep time by about 30 seconds per steep. 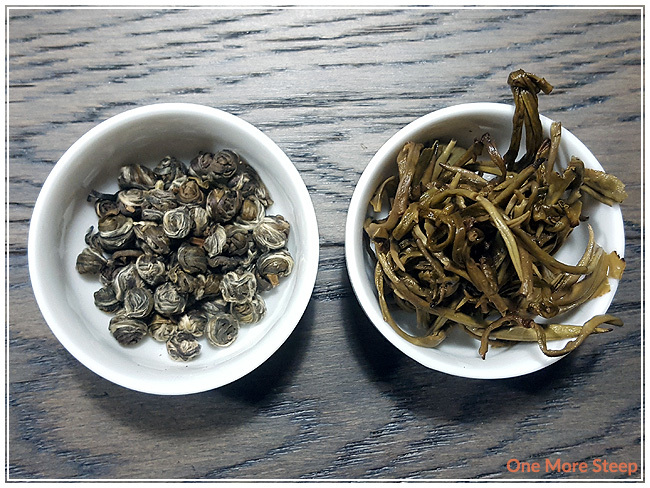 The tea pearls were mostly fully opened up by the end of the first resteep, and the colour intensified and became more yellow. The tea became more golden with each subsequent steep. The jasmine fragrance and flavour remained fairly strong until about the sixth resteep, when it began to taste more watery. I loved Grand Tea’s Premium Pearl Jasmine. The jasmine aroma and flavour was amazing, and there was a sweetness to the tea that was enjoyable. I found the pearls to be fun to watch as they steeped, and they resteep well! I think this tea would be great either paired with sweets or savouries. I had some leftover tea from the many steeps, so this wound up in a pitcher in my fridge. I’m happy to report that Premium Pearl Jasmine tastes refreshing and crisp when iced, so there’s an option for you as well if you’re looking for an iced tea. I think there’s good value in this tea with it’s ability to be resteeped, and the word premium in its name wasn’t wishful thinking.